A Peek at Littlewoods Ireland…. As we mentioned here before Laura and I had a fabulous evening in Dublin recently at the Littlewoods Ireland summer event! It was held in the penthouse suite of The Marker Hotel in the heart of Temple Bar Dublin. We were in our element perusing the rails and stands overflowing with summer attire ! We really wanted to just pack a suitcase full of stuff and head straight to the airport for sunnier climes! Now I have to admit I never realised what a fantastic range of clothing and labels Littlewoods sell! From well known brands like Oasis and French connection-they also carry some great own labels such as South and Definitions! They also have some celebrity designers on board such as Myleene Klass and Coleen Rooney who have designed lovely pieces for them. 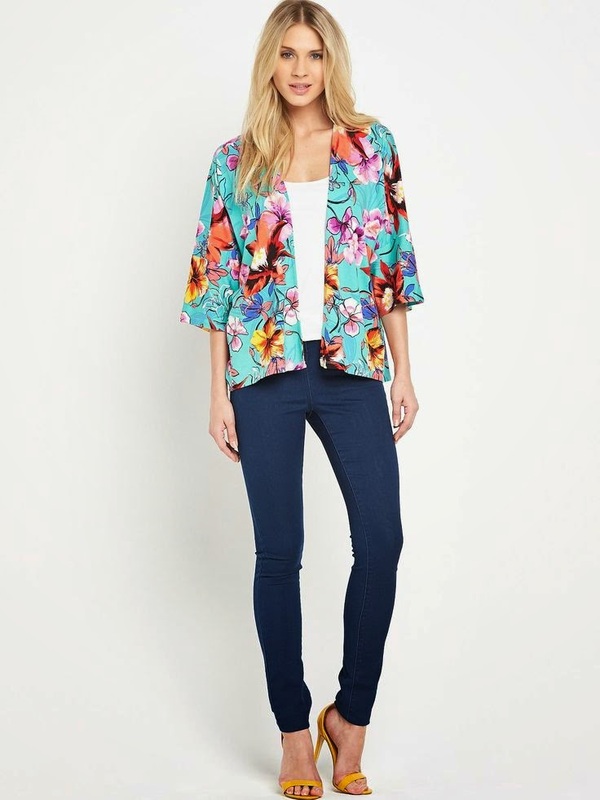 I love a little bit of floral action for summer so this multi print kimono from the South range will be a great standby piece for summer evenings or lazy beach days! I loved this two piece jumpsuit by Fashion Union and thought it would be a great piece to have for a spring/summer event. I like the simple style with just the right amount of detail on the front to give it a little bit of extra oomph! Lastly I am trying to add some good basics to my spring/summer capsule wardrobe so this grey cotton top in the Coleen range appealed to me as the quality is fantastic, the material way heavier than a normal tee and I liked the added bit of bling on the neckline! It can be dressed up for an evening out or look just as good for casual downtime. Dressed down with my white jeans and casual denim jacket. Dressed up a little above with a structured blazer and black cropped trousers. I will show you my other pieces as I wear them:) I hope you enjoyed reading about Littlewoods Ireland and just to mention they have 20% off until Friday with purchases over €50 using code:6AJ3P. There is also a lot of stock reduced all ready, so some great bargains to be had right now. Laura will be featuring her 3 pieces on the blog here shortly !